…and so, after many years…of searching, photographing, and searching again - I begin this blog, with my statement from my most recent solo photography exhibit, featured at the Kennedy Gallery in Portsmouth, N.H., from January 2nd to February 28th, 2015. It is late June of 1979. 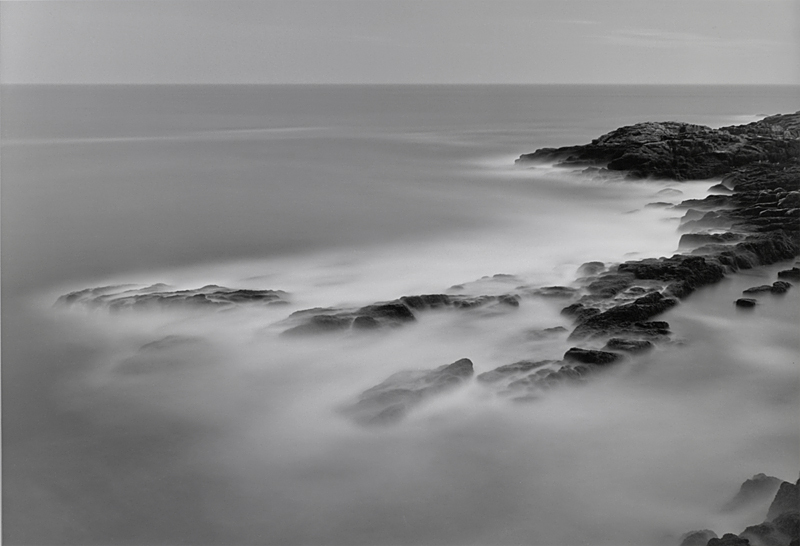 I am on a rocky stretch of shoreline along the Maine coast - at the water’s edge…peering into the viewfinder of my trusty Rolleiflex - at rocks, barnacles, algae…a small wave unceasingly re-forming itself - over and over. I then look away from the viewfinder, refocus my eyes, and my surroundings now seem not only different…but remarkably so. Aspects of the landscape…the sky, rocks, water, algae, barnacles…which had before been performing together in perfect harmony and synchronicity…are now doing so at a level of intensity such that anything foreign to this would present itself as would a sharp needle to a tightly inflated balloon. I find that my senses are now tuned to a pitch that exists in perfect symmetry to that which presents itself before me, and that the physical presence of my camera…what had been, before this, a solid, tangible, and somewhat complex assemblage of metal, glass, pinions, and springs…has now become transparent - a window - on one side of which resides not only that which I can perceive visually, but also something beneath the surface of this…something very real and compelling. On the opposite side of this window I float…weightless. While the experience I describe above was transformative, I had been “seriously” photographing for a good ten years before this. What was so different about this particular day and place? Perhaps the fact that I had pitched my small tent near that spot and had spent several days alone there, surrounded by the rhythms of the sea, unencumbered by the usual exigencies of daily life, had facilitated some kind of communion? But with what? Was this my seminal experience?…my “watershed moment?,” my enlightenment to the possibility of the existence of a “life force behind the surface of things” that so many have for so long tried so vainly to describe? And was this…is this - about kinship? An expression of something deeply and profoundly ancestral? Much has happened in the thirty five years which have intervened since that fateful day on that rocky stretch of shoreline. After a period of time spent fervently searching…studying the writings, life, and works of other artists, trying to glean something specific that could help me to finally see that which might exist behind the surface of things…I eventually learned to be content in the knowledge of the possibility of this, and to faithfully allow the feelings of congruence and symmetry to flow through me as I have, countless thousands of times…courting the mystery which carries me, weightless, through the perfectly transparent window that is my camera. It is now early September of 2014. I am, once again, at the water’s edge…this time on Star Island. The sounds and the smells of the surf have carried me to a spot high up on East Rock. Dark clouds are heavy and lowering…seagulls in the wind reeling. What I see through my camera beckons and guides me in a perfect ritual of give and take…a dance, with an extremely sensitive and responsive partner. Waves rolling in…softening and yet with a vitality undiminished over the duration of my exposure - showing me the larger truth of something that I cannot see physically - and yet there it is. And it is perfect.